Being away from Hawaii for any period of time will make you home sick for foods that are easy to get at every corner on the island. This includes Korean fast food, but made fresh at places like Yummy's and Yoonies Korean bbq restaurants. I've really been missing the fresh veggies side dishes and the fish jun so I decided to look up how to make my own veggie jun, a Korean pancake using thinly sliced veggies, flour, water, a dash of salt and if you can find it, Korean pancake mix without the MSG. Fortunately, I met a few Korean nationals here in Orlando and I was able to ask the wife where she bought her Korean pancake mix. Unfortunately for me, the store was quite a distance away, she later blessed me with a bag of Korean pancake mix when I saw her a few weeks later. The Asian markets nearest to me didn't have the mix without MSG so I was happy to receive it. The only difference is that if you don't have the Korean pancake mix according to the video below, it won't be as crispy but you could use only flour. A few adjustments I made was I use egg substitute instead of real egg and kosher salt (my favorite) and I was out of Idaho potatoes so I harvested some of the sweet potatoes from my garden. This version wasn't sweeter, there was very little difference in taste and it was just as good. I also had extra fresh button mushrooms and it was delish! Directions: after cutting all vegetables, place in large bowl, toss with salt and let sit for 3 minutes while preparing batter. Directions: mix all ingredients in mixing bowl (separate from vegetables) when you have mixed the dry and wet ingredients the batter should be runny, not thick. You can now add the batter to the vegetables and prepare a cast iron fry pan on medium heat with oil to fry so the pancake does not stick to pan. If you do not use a cast iron pan, the pancake will cook but may not get as brown but still will be tasty. Cut like a pizza and use your favorite dipping sauce. I like an Asian sweet chili sauce, but you can use ketchup or soy sauce. This recipe adapted from Aeriskitchen on youtube, I love her simple recipes and watch her videos over and over again. 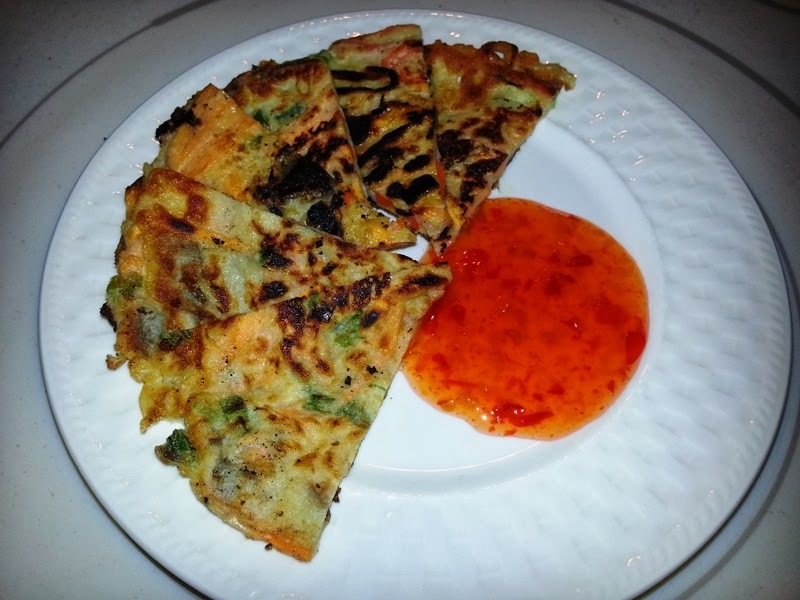 Watch the video below on how to make the Korean pancakes. 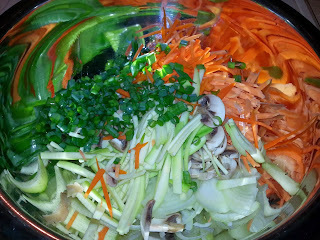 If you need more help on learning how to cut veggies watch the video on "How to Julienne Carrots for Dummies." If you're still not sure how to "julienne carrots" the Dummies video is for you. It takes practice but you can do it. 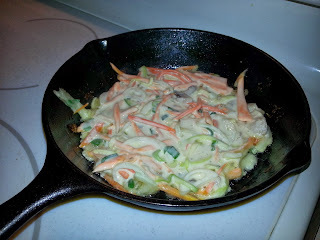 I once used the food processor, which is quick but more than I wanted in clean-up; in addition, the processor brought out a lot of liquid from the potato so I just hand cut the veggies now.